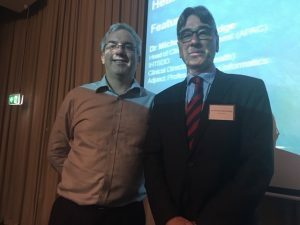 HISA member and senior health informatician Dr Michael Bainbridge was the special guest speaker at a recent Pitcher Partners healthcare client and stakeholders event in Brisbane. HISA Chair David Hansen (left) and Dr Michael Bainbridge at the event. He told the clinicians, today knowledge is doubling every 72 days and a doctor’s knowledge-processing capacity has an upper limit. “This is where technology can play a part in making available, at the point of care, the latest evidence-base to support quality patient care,” he said. Dr Bainbridge says quality data is paved with wrong turns. Structure of the data determines the quality of the output. So -health informatics – what’s in it for clinicians? The discussion concluded there is an opportunity for clinicians to influence the design and procurement of information systems that do not get in the way of clinical workflow, but truly enhances it!